We all know how this works now. AMOLED screens have pixels which light themselves, enabling power-efficient always-on displays of time (and other notifications, depending on the OS), while LCD screens rely on a relatively power-hungry backlight, meaning that for anything to display at all in most light conditions, the backlight has to be on. Scotching the idea of an always-on display on LCD-equipped smartphones. But.... not so fast. For Nokia has waved its engineering wand and worked a veritable miracle. Armed with Windows Phone 8 GDR2, which presumably includes the right enablers, plus Nokia's Amber update, which includes the 'Glance' modules, what happens (optionally) on the Lumia 920 is that, just as on the AMOLED-screened Nokia Lumia 820/925/928 and 1020, an always-on clock display is put forward as a screen saver (and, indeed, it moves around the display, as all good screen savers tend to do! 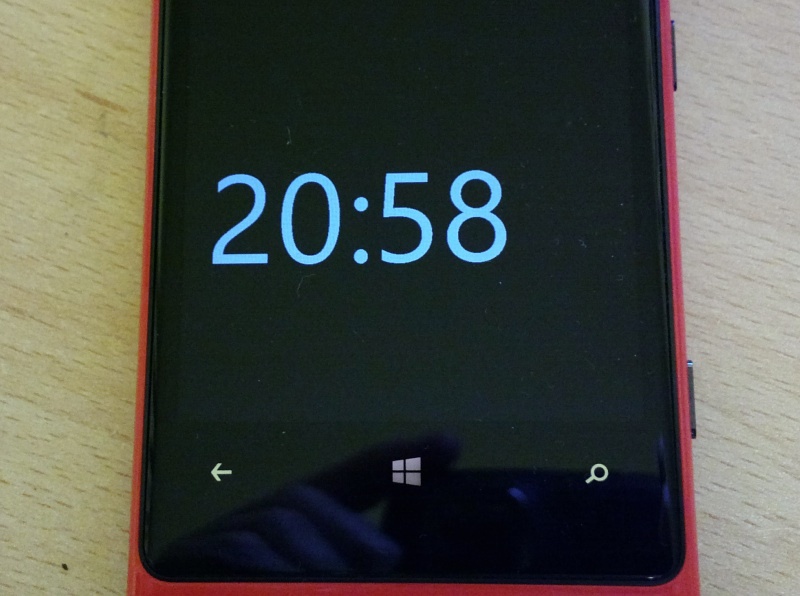 ), despite the fact that the 920's display is LCD and thus backlit. Moreover, there appears to be little or no effect on battery life. Which is clearly impossible. 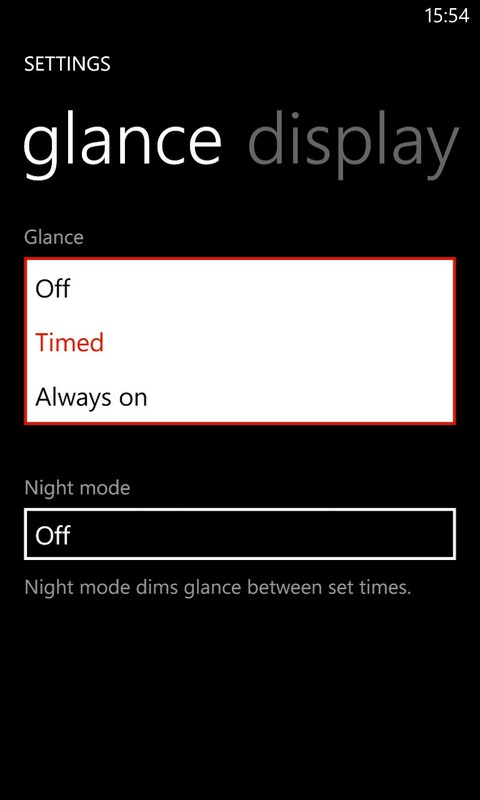 What seems to be happening is that, buoyed up by under the hood changes in WP8 GDR2, Nokia has found a way to run the LCD backlight at very low brightness, I'm guessing around 1%. Allied to the OS and Snapdragon chip supporting such a low level, low power process as maintaining a permanent clock, the end result is impressive. I've been testing this on the Lumia 920 (with the optional 'double tap to wake ALSO turned on) and the extra battery drain is of the order of a few percent a day, barely more than the 1% a day I usually reckoned on for the always-on AMOLED displays on Symbian smartphones a few years ago. The LCD backlight is being run at such a low level that, in normal lighting, you can't detect any light whatsoever apart from the region where the crystals are showing the time. At night, in the pitch black, you can see a background glow across the whole display, so we're not talking of a partial power up of the backlight, just of lowering its intensity massively. The end result is hugely satisfying though, credit to Nokia and Microsoft for working together here. The 925's always on clock is certainly brighter, but both are automatically being adjusted anyway, according to ambient light conditions. The 920's LCD version is still very usable indoors and a heck of a lot better than nothing, or having to keep reaching down to press a button on the device. 'Timed' keeps the clock on for a while, but for my testing I went for the full 'always on', with no regrets. 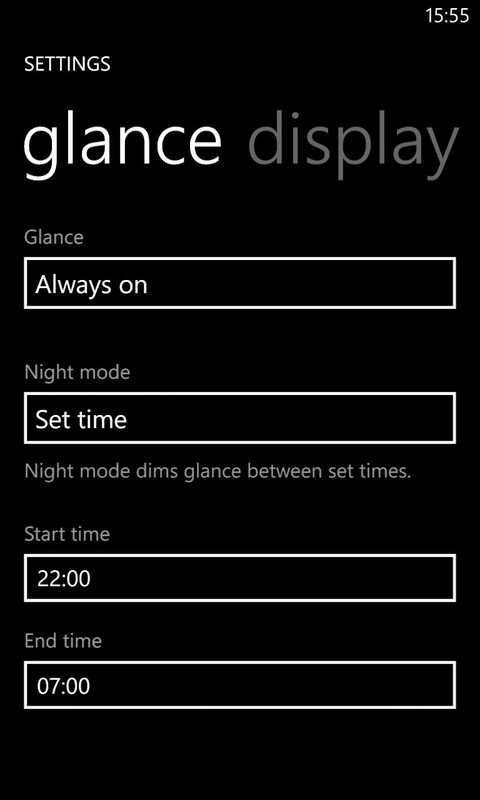 As shown in the right hand screenshot, I then also turned on 'Night mode', which turns the clock display a night-vision-friendly red during the hours specified. The only caveat to all this that I'd apply would be if you're spending a lot of time outdoors in the sun - the brightness of the Glance system is automatically ramped up once you head outside and I'd worry a bit more about the backlight's impact on battery life if it was having to compete with direct sun for very long! Happily, even when outside and mobile, your phone will hopefully spend a lot of its time either in a case, in a pocket or being used, so this is still not a showstopper in my view. There's more on this 'Glance' function in Rafe's extensive article here, but note that his/our worries over effectiveness on LCD screens appear to have been largely unfounded. Hopefully the same efficacy can be achieved on the Lumia 620, 720, etc. We'll know when the Amber/GDR2 updates arrive for these devices. In the meantime, features like this and the addition of Nokia Pro Camera appear to have given the now elderly (and quite cheap) Lumia 920 a whole new lease of life. Of which more in another, upcoming feature.